This compliment was given to recently deceased Congressman John Murtha by a local paper. In Pittsburgh, the Tribune Review is generally considered the conservative paper and that is why I subscribe and read it. I didn’t really expect the Trib to speak ill of the dead, but some of their compliments seemed a little out of touch in my mind. Murtha was described as “no greater champion of our armed forces.” I guess if you consider his full career this may fit, but I cannot get past his comments about several marines killing innocent civilians in cold blood in Haditha and calling their actions war crimes. All of the marines have either won their cases or the charges have been dropped against them. 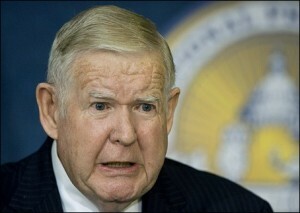 John Murtha never admitted that he was wrong in accusing them of crimes or apologized for his remarks. Representative Murth was also acclaimed for doing “what congressmen are supposed to do — represent and deliver for his constituents.” In a article about “pork” or earmarks, the Trib wrote, “Murtha, who chairs the House Defense Appropriations panel, obtained $160 million worth of earmarks to lead all House members.” While Senator Robert Byrd (D-WV) is widely considered the “King of Pork” John Murtha was not far behind. I guess that I feel that a great American would fight against pork spending rather than excelling in gathering it. The pork mentality (I better take it or else someone else will) is part of the problem with America. We all seem to want our little (or big) piece of the pie not acknowledging that the money is taken from us, filtered through the federal government and then given back to us minus D.C.’s cut. Pork is contrary to true conservative values. Obviously his constituents loved Mr. Murtha as they elected him for 36 years. Pork brings in the votes. Maybe it would be truer to say that Murtha was a Great Pennsylvanian. This article was published on Feb 9, 2010 . It is tagged most popular. You can follow any responses to this article through the comment RSS feed.